Rovers host their Championship rivals in round four of the Coral Challenge Cup, just two weeks after beating the same opponents 24-12 in the league. 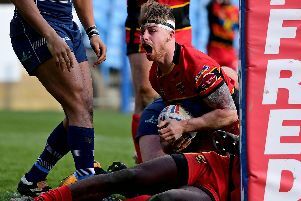 It was a different story for Carr’s side last weekend, however, as they suffered their first home defeat of the season with a 32-22 loss against Dewsbury Rams. And the Rovers boss says his side must bounce back when they host the Lions this weekend. “They are a good gritty team, they won’t go away,” said Carr. “We owe our fans a way better performance than what we put out (against Dewsbury). “We let them down and we let ourselves down. Rovers came from behind twice to lead against Dewsbury last weekend but eventually fell to their fourth loss of the year. And Carr felt that there were too many errors from his side cost them their unbeaten home start. “I am obviously disappointed. To play like that in front of our own fans is disappointing,” he said. “We weren’t good enough, it wasn’t up to our standards. “We made way too many errors and gave away way too many penalties, to even give ourselves a chance. “Slope or no slope, you are not going to win the game if you give away late-tackle penalties and drop as much ball as we did early in the count. “That is an individual thing, that isn’t a team thing. “Individually we need to look hard at ourselves this week because it is not good enough. Carr added: “We have got to be more clinical and that is not our standards and that is not what we are about. “It is a simple game rugby league. Play field position and hold onto the ball, we did neither. “And that is why we lost the game. “Credit to Dewsbury, they completed their sets and they didn’t give away the penalties that we did. Rovers will likely need to call upon some of their fringe players on Saturday, with their loan and dual-reg players set to be made unavailable by their parent clubs due to the threat of becoming cup tied. 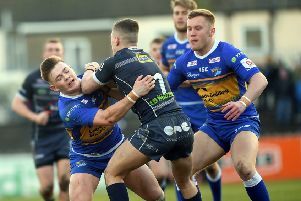 Leeds Rhinos trio Ashton Golding, Luke Briscoe and Harry Newman all featured last weekend along with loan players Ben Reynolds and Daniel Smith. The Featherstone pack will be largely unaffected while Carr will be required to fill the void at half-back after Ase Boas returned to Papa New Guinea last week. Boas has now officially re-joined the PNG Hunters.